Get Free 3RV29 Infeed Unit, Expansion Modules and Connection Plugs when you buy the Circuit Breakers and Contactors. But hurry, this offer is limited and ends on 30th April 2018! As an introductory offer to new users of the Sirius Innovations Control Gear, Siemens will be giving away the system components for the 3RV29 busbar infeed system free of charge during this promotion. 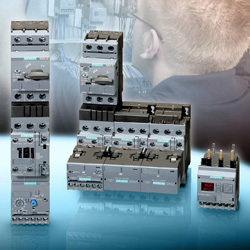 Simply buy the circuit breakers and contactors and Siemens will supply the 3RV29 infeed unit, expansion modules and connection plugs to suit the number of starters you require. Give Sirius Innovations and 3RV29 a try on your next motor control panel and experience the benefits first hand, you’ve got nothing to lose! Video: See how you can assemble load feeders quickly and expand them without time-consuming wiring, laborious screwing effort, or special tools - using the SIRIUS 3RV29 infeed system. Offer is only available to new Siemens Sirius 3RV29 users and is limited to a maximum of 10 starters per customer. This is a strictly limited offer which ends on 30th April 2018. The maximum total rating for starters on the 3RV29 is 63A/80A. Please check the total current drawn by the starters does not exceed this value. Siemens are happy to help with this selection. LC Automation can supply all the components, cables and accessories you need to complete your project. If you would like more information about Siemens Sirius 3RV29 infeed busbar systems, download a copy of the brochure on the right or call our head office sales department on 01254 685900, they will be happy to help.